Viewing topic "what would you recommend to purchase?" I am a total newbie still learning. Hubs plays guitar and needs keyboard to add to stage mix. 98% 80’s style with a little country thrown in from time to time. I actually learned a few songs, and played drum on my “Santa Clause” given Casio that I’ve had for decades. I need something I can have various organ/strings/drum sounds, change volume for each and background sounds, to play at the same time as I play other parts. I have always wanted to play, but never learned so I am throwing myself out there. I want something that will allow me to grow but be stage ready as I do. Please don’t make fun or be sarcastic, I need true advice from genuine people. THANK YOU! The beauty of any of the Motif family of keyboards is that the sounds are useful out of the box. So if you are looking for ‘stage ready’ then really any of the Motif family could suit your needs. It really depends on what your budget is for a keyboard. Are you saying you want to play various organs, strings and drums laid out across the keyboard at the same time, or is it just important that those sounds are available to play individually, and sound good? Do you want to play to backing generated by the keyboard itself? Do you want your new keyboard to feel like a piano, or are you good with a synth action, which might be similar to what you’re used to on your Casio? My budget is probably around $1200.possibly a little more. Some songs for example “Never Tear us Apart” I play in a string synth sound… while on “In the Air Tonight” I play a synth sound then there is a drum part as well ...which I would love to be able to play at the same time with each having their own volume level control and of course sound good coming through powered speakers. I’m good with synth action but like piano feel as well, so I respect both and mainly looking to fit our “little band” needs. It’s just me and hubs messing around and playing little gigs from time to time but not thinking I am the best performer by no means. For around the $1200 mark, a Yamaha MOXF6 may suit your needs. The MOXF has the same sounds as the recently discontinued (sadly) Motif XF flagship, but it is still current and available brand new. The MOXF6 is a synth action keyboard with great sounds and represents fantastic value for money. It’s a mid range workstation as such and sits above the MM and MX series, but below the Motif series. There may be more/other options in the used market, too. The MOXF6 has 1,152 normal voices and 72 Drum Kits. One thing you might not be aware of is that the MOXF doesn’t have speakers built into it, unlike the PSR and very likely the Casio you’ve used. 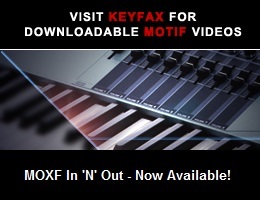 The MOXF is a professional level synth workstation and needs to be plugged into separate amplification/speakers. That goes for the Motif, MM and MX series too. The PSR is what I would describe as a consumer level home/arranger keyboard. One consideration might be if there’s a need or preference for the “Styles” of an arranger such as the PSR-S770, over the “Arpeggios” of a MOXF.